"an unusual crush for Provenza"
James Duff Alene S asks if I can let people in on the winter's story lines. James Duff We are going to try and finish up the Stroh story. James Duff And that should be interesting. James Duff Jack Raydor comes back. James Duff Provenza develops an unusual crush. James Duff And we end up having a flash mob of Santa's. Not all of whom are exactly what they seem. James Duff Of course, there is only one real Santa. James Duff Debbie S asks if Fritz Howard is going to become a regular, and adds that she misses him. I missed him, too! James Duff Jon Tenney is one of the most hilarious, enjoyable people you will ever meet. Everyone who works with him will tell you Jon is the funniest guy in the company except when G.W. is irritated. James Duff Which means G.W. is funny a lot. James Duff But I can't say more than that! He is taking a job with the LAPD. James Duff Robin B asks if we ever had a guest star who exceeded our expectations on Major Crimes? Oh, too, too many to list! James Duff I can't single out one without talking about thirty of them! And that I lack the space to do. James Duff But I will say we took particular pride in finding Chris Wood who played the Poster Boy in last year's finale. And Laurie Holden, who will be back next week as Commander McGinnis. And the boys who played the SWAT team. And Lindsay Price. Oh my God. You see what I mean? James Duff There are so many good actors who work with us. Like last year we had Jeri Ryan. James Duff And in this season alone, we had some amazing performances, many by actors who are fairly new to the art. James Duff Brandon M asks why Buzz wears a badge. 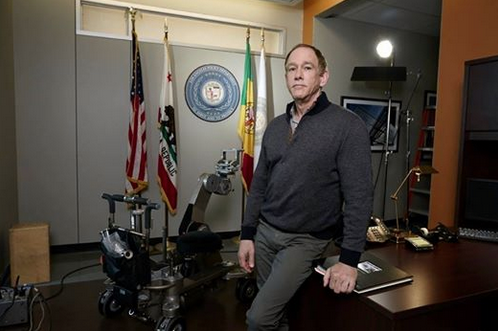 Buzz is attached to the LAPD's civilian Scientific Investigations Division, and is assigned to Major Crimes to document their work. James Duff And this job comes with a badge. But not the badge of a police officer. James Duff As an interesting side note. if you asked which part of their uniform officers would least like to give up, it would be a badge. James Duff Donan A asks why make Sharon's son a small-minded person? Well. I don't think we did that. I think he ends up being likable. But he has a journey to go on..
James Duff Dina R M asks if Sharon will adopt Rusty. Well, she's certainly going to try. In fact, you can bet her son has come back for a reason. Perhaps he has an opinion on the subject. James Duff Kathi CP asks if we're meeting Sharon and Jack's children and you are meeting Ricky tonight. Emily will be home this year for Christmas. James Duff Evelyn D asks if Jack will be making another appearance this season. And the answer is yes! We will have him for two more episodes this winter. James Duff Wanted to say a word to people from the previous posts that we can only do ten or eleven episodes in a row on our schedule before we have to go off the air. James Duff For example, we just finished with the editing of the finale and now we are correcting the color and mixing the sound and will be working on it to the last minute. James Duff We want to run all our shows in a row. We don't want to take a break. Once we are on, we want you to know we are on. James Duff And we will be back the first Monday after Thanksgiving, and go through the holidays with you, and the New Year, too.